Soumili Bangla use verious layouts for verious types of fonts. Soumili Bangla layouts is main layout. In addition to Assamese and Hindi layouts is in seperately available with in request with Soumili free of cost.. Choose appropriate keyboard layouts for you corresponding fonts. No character will be type correctly if you choose wrong keboard layouts for this fonts. Hence Choose Soumili bangla layouts for Soumili Fonts, Assamese keyboard for Soumili Assamese fonts and also Soumili Hindi Layouts for Soumili Hindi Fonts. Soumili Bengali Keyboard works two way. One for Normal Type and others for Accademic style type. When you type normaly [CAPS lock OFF] it will be work for Normal (including script) type. When you are in Caps on mode [CAPS lock ON] it will be work for Accademic. Keyboard Layouts are designed as Traditional Typing Machine. Generally which used for DTP or Compose. All Combination character will be apear with linked [named hasanta - d] key. Bengali Keyboard layout for traditional method. Most of the Bengali user use this keyboard layouts. Download Keyboard file (Soumili Bangla KK.kxx) from download section & install with Soumili Bangla Pro. Bengali Keyboard layout for Bijoy Keyboard Style. Special Bengali keyboard layouts. Download Keyboard file (Soumili Bijoy.kxx) from download section & install with Soumili Bangla Pro. Bengali Keyboard layout for traditional method. Special Bengali keyboard layouts. Download Keyboard file (Soumili Bangla SKP.kxx) from download section & install with Soumili Bangla Pro. Bengali Keyboard layout for easy method. Special Bengali keyboard layouts. Download Keyboard file (Soumili Easy.kxx) from download section & install with Soumili Bangla Pro. Assamese Keyboard layout for traditional method. Most of the Assamese user use this keyboard layouts. 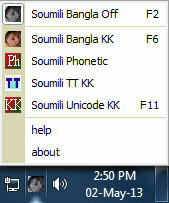 Download Keyboard file (Soumili Assamese KK.kxx) from download section & install with Soumili Bangla Pro. Assamese Keyboard layout for traditional method. Few of the Assamese user use this keyboard layouts. Download Keyboard file (Soumili Assamese SK.kxx) from download section & install with Soumili Bangla Pro. Hindi Keyboard layout for traditional method. Most of the Hindi user use this keyboard layouts. Download Keyboard file (SB Hindi KK.kxx) from download section & install with Soumili Bangla Pro. Hindi Keyboard layout for traditional method. Few Hindi user use this keyboard layouts. Download Keyboard file (SB Hindi SK.kxx) from download section & install with Soumili Bangla Pro. We provide user define keyboard layout in about 24 Hrs for Soumili Bangla Pro application and Soumili fonts without extra charge. Also other fonts which is available in our end. If you have required and you are Soumili user or going Soumili user send your layout in filling this blank layouts. Contact for all other keyboard.